The Texas Mamma Jamma Ride is a 501(c)3 non-profit organization dedicated to helping people in our local community facing breast cancer. Our amazing community of cyclists, volunteers, sponsors, and beneficiary organizations come together each year to raise funds and participate in one of the best supported and most fun bike rides in Texas. 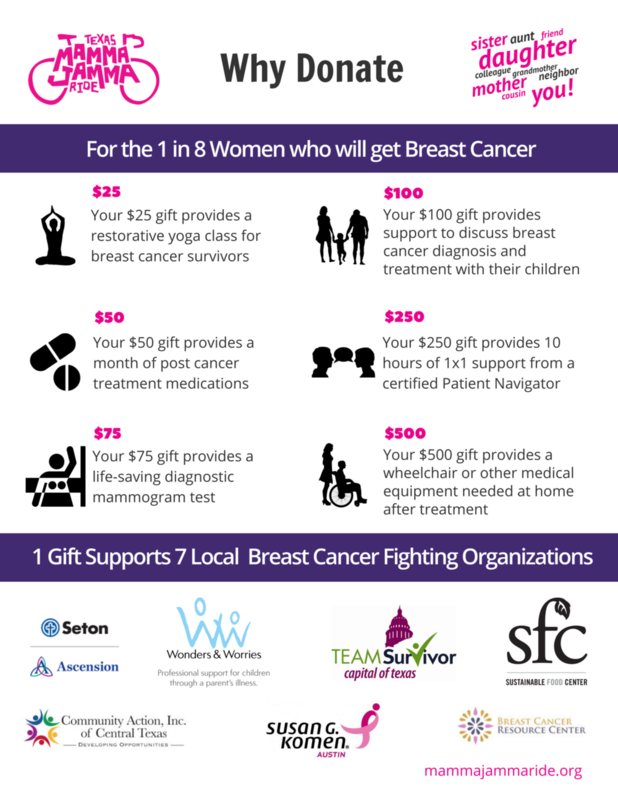 The Mamma Jamma founders were committed to raising funds to support local organizations to ensure that people in Austin and the surrounding communities have access to the care and support they need to fight breast cancer. Modeled after Hill Country Ride for AIDS, each organization benefiting from Mamma Jamma invested seed money to start the ride. Each year, the net proceeds from Mamma Jamma are distributed to the beneficiary organizations to help those facing breast cancer.